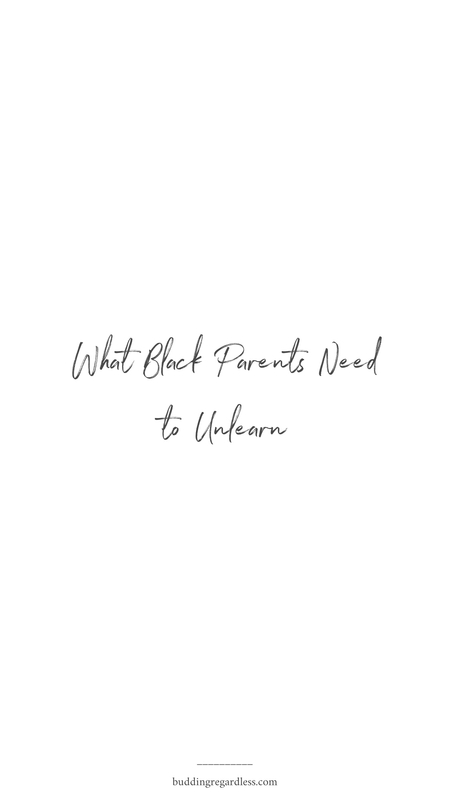 It is still August and we are still Unlearning here on Budding Regardless and on today’s episode I collaborated with my super cool mother on What Black Parents Need to Unlearn. If you missed out on the previous episodes of this series you can check them out whenever you get a chance – Episode 1 and Episode 2. Why did I decide to tackle things specifically ‘black’ parents need to unlearn? Mainly because it is black parents who struggle a lot with letting the past go and letting their children be themselves completely. Black parents seem to find it slightly difficult to understand that their children are living in a totally different era than them and in as much as it was a mission once upon a time, I have finally gotten my mother to understand this and it as made my life so much easier and ‘free’. Normally, parents have this tendency of wanting to decide for their children what they should be studying and this hinders their children from making their own decisions and results in them living their lives based on what their parents want. A parent is reluctant to be supportive if their child says they would like to study something like Music when they had planned to take them to Medical school and they don’t seem to want to understand why their child would want to take a gap year after high school. Parents expect their children to dress like they did back in their days, meanwhile times have changed drastically from then and now – in this day and age even wearing just a shirt acceptable and in fashion. Also, black parents tend to worry about their children speaking too much English and conclude that they are completely forgetting their roots and culture. It is natural for a parent to introduce their children into their religion from a young age but as children grow up, they are exposed to a whole lot of other religions which might spark their interest. Forcing a child to commit themselves into your religion only pushes them away, instead of doing so, be understanding and make them understand that you are doing what you think is best for them. Parents can spot pretentious friends quicker than their children can and that is acceptable but encouraging them to associate themselves with children that are on their ‘level’ money-wise isn’t recommendable. Children should be able to mingle with anyone despite their background, what they have and what they don’t have. Children have been finding it so hard to speak to their parents about anything that is bothering them because they fear being judged and shouted at. This problem leads to things such as depression and even when parents notice that their child isn’t okay, they still do not ask anything about it. Being open and friendly to children helps them speak out about what they are going through or what is worrying them. Black parents always seem to assume that they are always right merely because they are older but that is not always the case. In some cases, parents even shout at their children when they speak up about something and refuse to hear their children out. Not apologising when they can clearly see that they are wrong breaks the bond they have with their children without them even noticing. Boys and girls, should share house chores. Both should be able to cook and do the garden too, children should be taught how to be completely independent from a young age. You find that when a boy grows up, he claims to be a man even if he can’t cook and what makes a girl a ‘woman’ is if she can cook – this needs to be unlearned. Parents tend to put a lot of unnecessary pressure on their children as they grow up and approach their late 20s by asking them when they are getting married and starting a family. It is not everyone’s goal to get married and even those who do want to get married or start a family will do so when they decide that they are ready. I applaud both you and your mother for coming together to raise these points. Well done. May God continue to His work in both of you. May your relationship only get stronger with each other and in Him. Have a great week. I loved this post, and related to it so much! So many parents need to learn these ..well written! I sooo relate to this post. The main reason I don’t go to church is because when I was a kid, my grandmother used to make us go to church every Saturday 😭(Shembe). She was also strict with the church rules, which included; bathing with cold water on Saturdays and eating cold food before 6pm ( so thats like the whole day) as we were not allowed to warm it up. My mom never apologise when she’s wrong. If she realises that she’s wrong, she’ll just make jokes that will make you laugh, hoping that you forget about everything. I don’t forget but I forgive her. I love this post. I should print it and leave the paper in the passage, intentionally, so that it’ll look like I dropped it by mistake . The title would be written in bold and in capital letters. I’m not a Shembe anymore fam. I don’t go to any church at all. There’s one church that I love though, I forgot it’s name. It’s here in Scottsville(PMB). I’m bad with directions, I would tell you where about. Anyways I love mail because there’s *FREE* food after service and also it doesn’t take too long. It’s only an hour and I still manage to concentrate for the first 5 min. At least your mom tries. Reblogged this on Being Yourself. Very great post. I can say that most white parents need this lesson too.